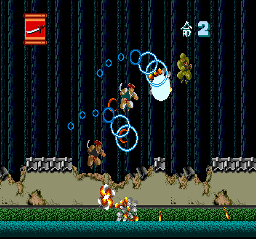 Ninja Spirit is one part Shinobi and one part shooter, mixing the side-scrolling ninja action of the classic Genesis title with the power up system found in most shooters. The game play is almost mindless – jump around avoiding enemy fire while mashing the attack button, much like most shoot-em-ups. The only real strategy involved is choosing which weapon to use in each situation, as they all have strengths and weaknesses that must be considered. Each level is a unique environment with a diverse variety of enemies, so the game never feels boring or repetitive. Ninja Spirit also has the colorful, detailed graphics that higher-quality Turbo games are known for, although the sound effects are a mixed bag and I was never really able to get in to the soundtrack. I really liked this game, but there were several areas that were frustratingly difficult. Difficulty in a game is a good thing, but when you aren’t learning anything by dying and have to keep repeating the same section until you complete it through blind trial-and-error, that’s bad game design. Once you figure out the trick to getting past these situations, the game becomes quite simple and most of the challenge is gone. Although you have a 5-point life meter, the game has plenty of ways to kill you with one hit, and many times I was killed before I had a chance to react to the danger. The game can also be played in a harder mode that removes the life meter, but there are already so many ways to die instantly that the harder mode doesn’t make much difference. I suspect that the game designers knew that the game was unreasonably hard in places, as the game has unlimited continues and always re-starts your game at the nearest resume point instead of restarting the level. That’s like having an unlimited number of lives! This means that much like Keith Courage, the game can be beaten the first time you sit down with it unless you voluntarily choose to limit yourself to a set number of continues. This definitely lowers the game’s replay value (and its score in this review) by removing most of the challenge, but the gameplay itself along with the interesting and varied design will compel you to revisit the game every now and then. This would be a hard game to recommend if it were one of the TurboGrafx’ pricier titles, but as one of its cheapest it’s definitely worth picking up. Buy Ninja Spirit on GameGavel or Amazon. Tagged Action, HuCard, Irem, Ninja Spirit, PC Engine, Review, turbografx, turbografx-16. Bookmark the permalink.